When it comes to tornadoes there are a lot of myths surrounding them. 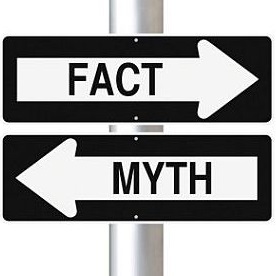 Many of these myths are created and circulated by sources we think we can trust. It's common for the media to spread misinformation and speculate on all things related to tornadoes. This is mostly due to poor research and the common belief that tornado folklore is accurate. A perfect example of main stream media spreading misinformation was when TIME magazine published a picture with a caption that suggested that highway overpasses could be a safer place to shelter from a tornado than building. To help stop the circulation of tornado myths and misinformation we put together the below commonly repeated myths. We broke this page into three sections, tornado safety related myths, tornado behavior related myths and tornado geographical related myths. You'll probably be amazed to realize what is fact and what is fiction when it comes to tornados. Help stop the spread of inaccurate information and educate others on common tornado myths. Don't be surprise that by the time you finish reading this page you'll find some facts you thought were real are nothing more than myths! Tornado Safety Related Myths - Myths related to tornado safety. Tornado Behavior Related Myths - Myth related to tornado behavior and activity. Tornado Geographical Related Myths - Myths related to tornadoes in geographical areas. Southwest corner of your home/building/shelter is the safest location - In 1887 John P. Finley wrote a book on his observations of his tornado research. While he published some ground-breaking information on tornadoes he also helped created this tornados myth. 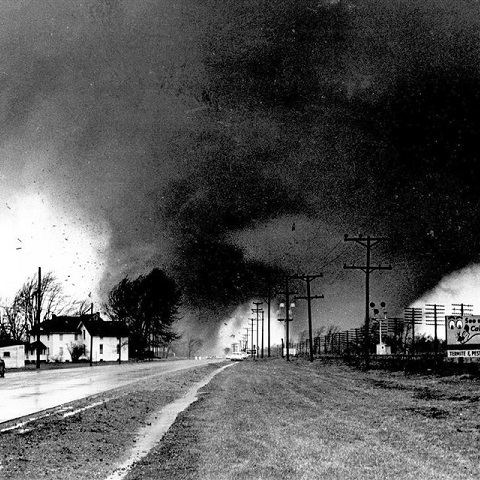 John believed that tornadoes only traveled in a northeast direction and that derby they created would be carried in the direction of its propagation. The 1997 F5 Jarrell tornado is a prime example of his misconceptions since that tornado moved in a south-southwesterly direction. It's recommended that you always seek shelter in the lowest floor of a building, preferably under an I-beam or staircase, regardless of the type of building you're in. Open all the windows in your home when a tornado warning is issued - This is an extremely dangerous myth because it takes away critical minutes that could be used to reach shelter. It used to be widely believed that you needed to open your windows during a tornado to equalize pressure and prevent your house from exploding. A violent tornado will only have a 10% drop in pressure which isn't anywhere near enough to cause your home to explode. Ignore your windows and seek shelter immediately when a tornado warning is issued. A highway overpass is an excellent tornado shelter - This myth gained huge traction in 1991 when a TV crew survived a tornado unharmed by sheltering under an overpass in El Dorado, KS. This event had nationwide coverage with video of the event and that helped perpetuate this myth to a dangerously high status. The conclusion for scientific evidence from the Oklahoma outbreak in 1999 actual proved that overpasses are actually one of the worst places to seek shelter during a violent tornado; mostly due to the wind tunnel effect that can accelerate flying derby speed even during weak tornadoes. You can outrun a tornado via a vehicle - The theory behind this myth is a vehicle can travel faster than the average tornado, but the key phrase is average. There is no way for someone to know the travel and wind speed of a tornado just by looking at it. Plus, the flooding, hail, and flying derby from a tornado can put someone in a vehicle in danger. The official directive from the National Weather Service is if you spot a tornado nearby to abandon your vehicle and seek shelter in a nearby building, culvert or ditch. A brick or stone building can protect me from a tornado - While a brick or stone building can provide better protection during tornado a violent only can easily turn a brick or stone building into a pile of rubble. It's recommended that you always seek shelter in the lowest floor of a building, preferably under an I-beam or staircase, regardless of the type of building you're in. If a tornado isn't coming directly towards me I'm safe - In the past it was common belief that a tornado would only travel in a northeasterly direction. While it's true that most tornados will move northeast, this is most due to the direction the storm is traveling. Tornadoes are erratic, unpredictable, and can come from any direction. A prime example is the 1997 F5 tornados that struck Jarrell, TX which traveled southwest. Tornado intensity based on funnel size - A dangerous myth is the size (width) of a tornado's funnel is a way to asses it's intensity. Over the past 6 decades there have been more than 100+ violent tornados (F4/EF4+) with just a maximum width of 300 feet. It's also common for a tornado to change sizes during its lifecycle, making size as an estimate for intensity an invalid method. Do not ignore a tornado because it's small or try to get a picture; seek shelter immediately. Tornado only travel in one direction - There is still a lot of misconception on the travel path of a tornado. While the vast majority of tornadoes will move in a northeasterly direction it's possible a tornado can travel in any direction. . Tornadoes are erratic, unpredictable, and can come from any direction. A prime example is the 1997 F5 tornados that struck Jarrell, TX which traveled southwest. Tornado must touchdown to cause damage - There is a dangerous belief that a tornado needs to touchdown (reach the ground) to cause damage. This can be a deadly assumption because people may not seek shelter or thrill seek because they believe a tornado hasn't or won't touchdown. The violent winds and debris from a tornado that hasn't touched down can be just as deadly. Tornadoes never strike the same place twice - The interesting part about this myth is it has been disproved in some statistically amazing ways. For example, the town of Codell in Kanas was hit by a tornado three years in a row (1916, 1917 & 1918), on the exact same day (May 20th). There is nothing to prevent a tornado from striking the same area twice. Tornadoes only occur in North America - It's a common belief that tornadoes only occur in North America; with concentration in tornado alley. However, tornadoes have been witnessed on every continent with the exception of Antarctica. While the majority of tornados do occur in the United States they do regularly occur in other areas, such as Australia, Bangladesh, Philippines, United Kingdom and Western Russia. In fact, the tornado with the great loss of life occurred in 1989 in Bangladesh, claiming 1,300+ souls. My community is protected from a Tornado by a large river or body of water - Many people believe that different types of terrain and prevent or protect them from tornado. Large rivers and lakes do not protect you from tornadoes! A tornado can form over a river or lake (called a waterspout) or cross over them. The 1840 Natchez was witnessed traveling down the Mississippi river and produced hundreds of fatalities. Rivers, lakes and other bodies of water will not protect you from a tornado. Living on a mountain protects you from a tornado - There is a belief that a tornado form or travel up/down a mountainside. Tornadoes have been witnesses on mountains as high as 12,000 feet above sea level and have the ability to travel up a ridge unaffected for at least 3,000 feet. In a 2011 tornado outbreak several parts of Tennessee, Alabama, Virginia and Georgia had tornado touchdowns in their mountainous regions. A mountain will not protect you from a tornado. Tornadoes are attracted to mobile home and trailer parks - For decades there has been a misconception that mobile homes can attract a tornado. Tornado statistics between 2000 to 2008 show 539 poor souls lost their lives to a tornado; more than 50% of those fatalities were mobile home related. Since only about 7% of the homes in the U.S. are mobile homes one could come to the conclusion that this myth is accurate. However, these fatalities are most due to the fact that mobile homes are far more susceptible to damage from a tornado. The media is great are reaffirming this myth since they will widely report on areas damaged by tornadoes that have loss of life. Tornadoes don't strike downtown areas - There is wide spread belief that a tornado cannot strike a downtown area of a large city. In fact, there are well over one hundred recorded instances of downtown areas being struck by a tornado, with many of them having two or more occurrences of a tornado strike. This myth is probably due to the fact that downtown areas cover such a small geographical area, reducing the actual chance of a tornado forming and striking one of them. However, just because the chance is small it doesn't mean it can't happen. Tornadoes don't form during the winter - Because tornadoes require warm weather to form they are quite uncommon during the winter months. Just because they are uncommon doesn't mean they don't happen. In fact, tornadoes have been recorded traveling over areas with snow cover on the ground. Tornadoes in the winter (Dec thru Feb) tend to be more dangerous since they statistically move faster than they do during tornado season.